Set during the conquest of West California in the 1850’s, an group of soldier take in a man whose just spend three months in the wilderness, eating his friends to survive. 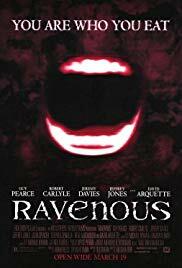 Ravenous is a hard one to describe. Fundamentally, it is a slasher set in an historical set-up. Where-as the army costumes may trick you into thinking that this is a war film, you’ll soon enough realize that it is 100% a horror movie. The film treats of cannibalism, and makes the cannibals look almost like a race separate from humans, and at times it almost seems as if you are watching a vampire film. The way it deals with cannibalism, its reason, its effect, and the morale part of it, is fascinating and brings a great psychological dimension to the film. All of this is mixed with a surprising amount of gore, guts and blood. As in any cannibal film, there are a couple of really atrocious scenes to spice up the all experience. The story is great too, but it draws its real power from the awesome performance of its main actor Guy Pearce (Full Monty, 28 Weeks Later).